Medical Principles and Practice (MPP) was first published in September 1988, 4 issues per year except 1990-1992 and 6 issues per year effective 2004 (Volume 13). MPP has been listed in Index Medicus, and its online counterpart, Medline, by the US National Library of Medicine, Bethesda, Maryland, USA since June 2002. MPP is also listed in bibliographic services, including PubMed (US National Library of Medicine), PubMed Central (US National Library of Medicine), Web of Science (Clarivate Analytics), Science Citation Index Expanded (Clarivate Analytics), Google Scholar (Google), Scopus (Elsevier), Embase (Elsevier), Pathway Studio (Elsevier), EMCare (Elsevier), Academic Search (EBSCO), CINAHL Complete (EBSCO), STM Source (EBSCO), WorldCat (OCLC). For indexing, the abbreviation of the Journal is Med Princ Pract. 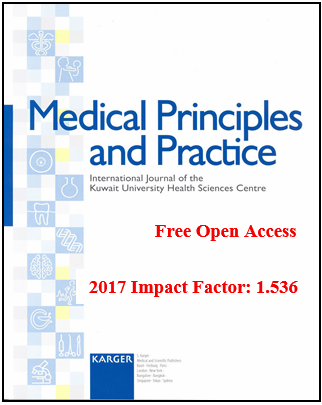 Medical Principles and Practice, the journal of the Kuwait University Health Sciences Centre, aims to be a publication of international repute that serves as a medium for dissemination and exchange of scientific knowledge in the health sciences. To publish original research in the health sciences. To publish peer-reviewed articles of current international interest in the form of papers, reviews, case reports, short communications, conference proceedings, discussion forums and letters.